What a year! 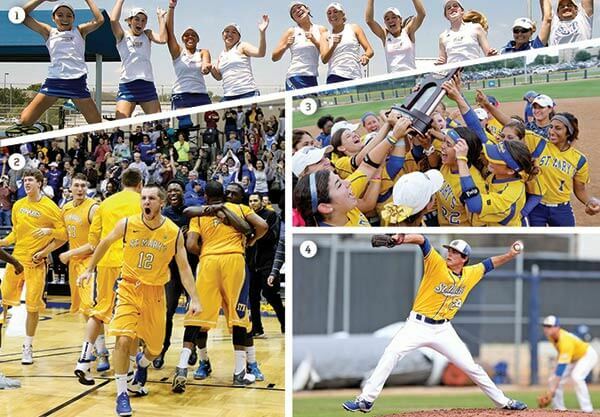 St. Mary’s Athletics has strung together many impressive seasons in many different sports during recent years, but 2014-2015 will go down as something special: three sports in tight national championship chases, buzzer-beating playoff wins, and a record number of academic award winners, just to name a few. Add it all up, and St. Mary’s took home seven regular-season and postseason Heartland Conference championships in men’s basketball, baseball, softball and women’s tennis; won a pair of regional titles in softball and women’s tennis; and saw three teams — softball, women’s tennis and baseball — stand among the final 16 teams in their respective NCAA national tournaments. Haley Richter for CoSIDA Academic All-America honors. This was the most CoSIDA Academic All-Americans, which are voted on by the NCAA Division II sports information directors, for St. Mary’s in a single year. St. Mary’s saw seven student-athletes earn All-America recognition this year — the most since 2004 — and a school-record 10 student-athletes receive academic all-district honors. Down 20 points midway through the second half of the Heartland Conference Men’s basketball semifinals, St. Mary’s season appeared to be slipping away. And then magic happened. Kriston Minor capped off an amazing rally against UA Fort Smith by sinking a 30-foot 3-pointer to force overtime in an eventual 90-88 victory. St. Mary’s went on to win the Heartland Conference championship and earn its fourth-straight NCAA Tournament bid. Softball came close to adding a third national championship trophy to its mantel, advancing to the Women’s College World Series for the fourth time under legendary coach Donna Fields. The Rattlers were led by a special senior class that included All-Americans Vianna Gutierrez Touchtone, a top-10 finalist for the National Player of the Year award, Nicole Sardelich and Taylor Vidrine. It marked the Rattlers’ first World Series appearance in a decade. Rattler Baseball nearly joined the Softball team in the World Series, falling one victory short after dropping a 5-2 heartbreaker to Angelo State in the regional championship game. The Rattlers saw memorable performances turned in by numerous pitchers at the tournament, including a 186-pitch effort across two games from All-American Matt McClain.